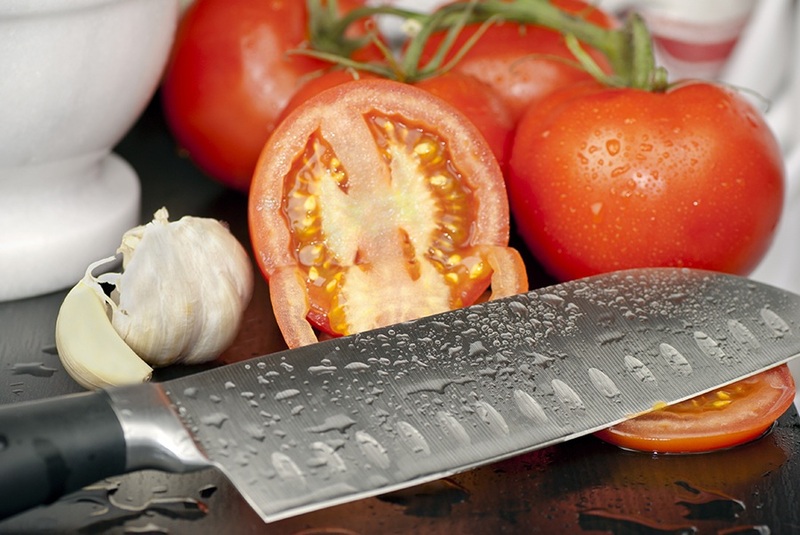 Have you ever wondered if you're actually using the right knife to cut a certain type of food? Or you just basically use one knife for everything? 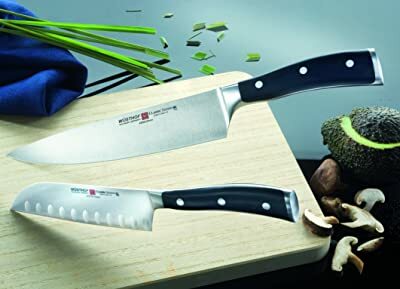 You don't exactly need to have such a wide collection of knives, but it wouldn't hurt to actually know which is the right knife for cutting up pieces of meat, vegetables or even bread. There is this certain knife that is just perfect for slicing meat, fish, and vegetables thinly and it is called Santoku Knife. If you don't know what they are and would like to give them a try, here are the 2019 Best Santoku Knife. WHAT IS SANTOKU KNIFE USED FOR? Who wouldn't want to have a decent Santoku kitchen knife in their kitchen? Surely, you would want something you're extremely comfortable with, have the best quality but of course something that wouldn't cost you a big amount of money. 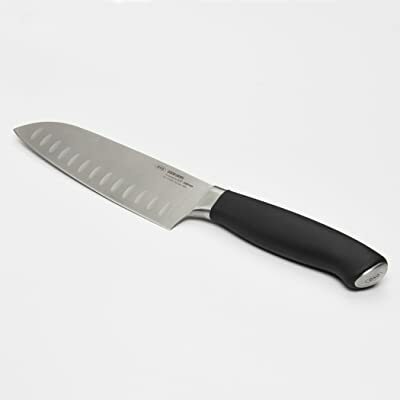 This is why I have listed down the 10 best Santoku kitchen knife in the market and all of their qualities including their PROS and CONS for you to be able to identify easily which Santoku knife will work best for you. First on our list the best among the rest which is the Shun Santoku Knife. Because if you are looking for the finest Santiago kitchen knife then, this is the one you are totally looking for. 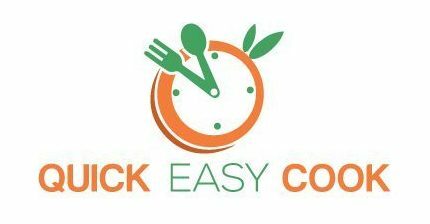 It doesn't matter if you are a professional chef or just an amateur cook at home. Coming from a trusted brand, the Shun Premier, you wouldn't really go wrong with this. They have a wide collection of several different knives from the Kershaw Knives, which is a company based in Oregon, USA and they make such well-crafted knives. This santoku knife, in particular, is made of two different types of steel, that actually has a core of a 7-inch blade which is made of the finest Japanese steel that has an incredible edge retention that enables the blade to remain sharp for a couple of years. There are about 16 layers of Pattern Damascus steel on each side of the core, that adds beauty to the blade and also for to be more flexible and strong. Besides the fact that it works like magic when it comes to slicing food very thinly, unlike the others, the Shun Santoku Knife has a hammered-like finish that is actually called as Tsuchime. It also looks very nice and classy that creates some little indentations on the knife’s surface that actually helps when it cutting. It is also not uncomfortable holding it which is of course what we all want in a knife because elf it's oblong shaped handle that is actually made of hardwood. Sharp with a high-quality standard and you wouldn’t need to keep on sharpening it. Now if you are looking for a less expensive version of the Shun Santoku but still wants a knife that is very high quality and would not disappoint you, well, the Global G-48 Hollow Ground Knife would definitely impress you. It wouldn't be considered as the second best for no reason. As expected, its blades are actually made from stainless steel that is high quality. The Shun Premier is way more expensive than the Global Ground Knife but it is indeed worth it since it is one of the best knives in the market today. It all falls down on what exactly you are looking for. Global is such a close competitor of the of the Shun Premier when it comes to Santoku knives but they have a cheaper option. 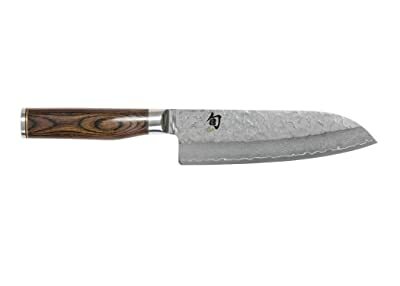 If this is your first time buying a Santoku knife, you could go for the Global one since it is cheaper but is also do magic, and if you don't really like it, you wouldn't feel too bad since it is not that expensive. But if you know your way and have a decent amount of experience when it comes to Santos knives then you should not settle for less if you could go for the best. When it comes to a greatly shaped santoku knife, Wusthof Ikon Santoku is the one you should be rooting for. 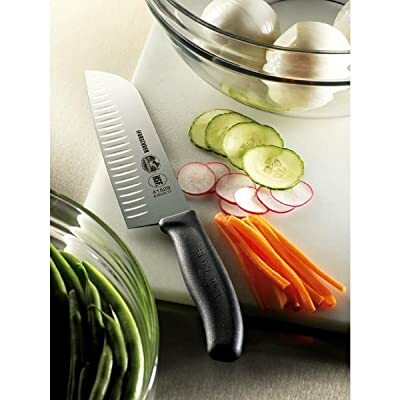 It comes in a traditional size and it comes with a hollowed side that helps when slicing so that the food would fall off and not stick into the blade that makes it great for chopping, slicing and dicing vegetables. The Wusthof Santoku knife is a special 7-inch Santoku knife that is made in Germany. And just like the Global G-48, it is a hollow ground santoku that actually is very versatile and is made of high quality German high-carbon stainless steel that is laser-controlled and tested. It has double bolsters that actually proved balance for an incredibly effortless cutting. If you're looking for a fancy looking santoku knife then the Yaxell Gou version might the one for you. Its design looks very sophisticated that would make you want to buy a set of these knives for it to be just a decoration for your kitchen. But then again, it is really not advisable to buy a knife just because it looks good. Been there, done that, never doing it again. However, this Yaxell Gou Santoku Knife is something special, despite being so pricey, it is also incredibly worth it because of its excellent quality that wouldn't definitely turn you down. The Yaxell Gou Santoku Knife is actually manufactured in Japan since it is a Japanese company that has been running since 1932 and they wouldn't last this long if their knives are not high quality. It is described as a “triple threat” because it promises to be sharp, hard and durable. It is also very expensive because of its Damascus-style Japanese chef’s knife look. Another Japanese made santoku knife is the Miyabi Kaizen 7-inch Granton Santoku knife and it made it through the Top 5 because if all fails. This is considered as the go to santoku knife because it goes so well with vegetables and fish with an extremely comfortable handle. Just like the previous one, it also undergo the advanced ice-hardening technique to make the blade strong as steel. 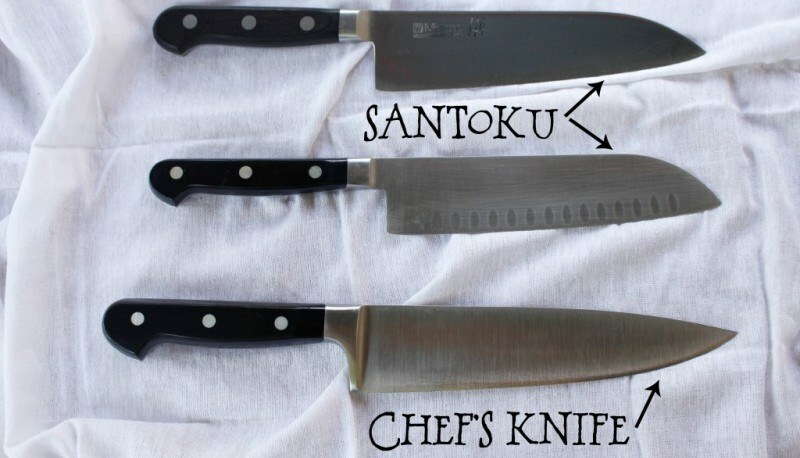 This list wouldn't be complete if the Ramblewood Classic Damascus Santoku is not here. It is technically a cheaper version of the Yaxell and both works wonders since it is also best for slicing, dicing and mincing. What I like about this santoku knife is that it has a unique design on its blade. This Santoku knife is a general purpose knife that also originated from Japan. Almost every Japanese product is high quality so you wouldn't have to worry about it being terrible in that department. This santoku knife from J.A. Henckles is a really nice-all around knife that comes in a very affordable price and it is very easy to work with. There are some knives who are kind of heavier than a santoku knife supposed to be but this one just weighs perfectly and is an excellent alternative for an extremely high quality an expensive knife. If talking about slick and nice looking knife, then this OXO Good Grips Santoku can do the job. What I like about this is that is cheap but the quality is just too die for. You wouldn't expect something this cheap to actually do wonders when It comes to slicing vegetables, fish and meat. 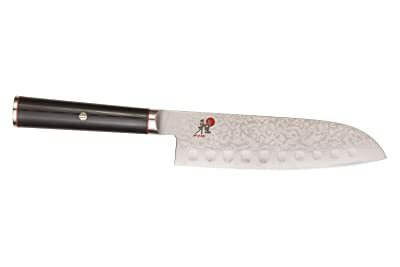 One of the nicest looking santoku knife is this Top Chef Santoku because of its fancy slick design. It is officially licensed by the Bravo TV Top Chef so you know it will do a decent job. This is probably the cheapest Santoku knife you can get in the market today. The blade is actually very thin and nice for slicing thinly. So basically, a lot of people doesn't really know is the purpose of a santoku knife. It is actually considered as a genereral purpose knife that is very much like a western chef knife. It is pretty much used to make thin slices vegetables and meat. Since Santoku knives are originally from Japan, they are best used when it comes to slicing up sushi, where in you could totally tell how thin it slices. So if you are a big fan of sushi then you should use a decent santoku knife. Santoku Knives are much more difficult to cut with when you're doing it in a rocking motion. It is actually best if you just simply use it for slicing meat, vegetables and fish. The traditional chef knives are more suitable for cutting this way. With the appearance, the santoku knives are actually more thin and a little shorter and lighter compared to chef knives. Because santoku knives normally come in 7-inches long while the chef knives come in 8-inches long. Although, santoku proved that when it comes to quality, it is actually higher than the chef knives and is also more appealing to look at because of its sophisticated design on the blades. Japanese santoku knives are not really ideal for chopping meat that has bones on it because of the hard steel. It is very easy to work with compared to some other kitchen knives. It is versatile and can be used for mincing and slicing food very thinly. 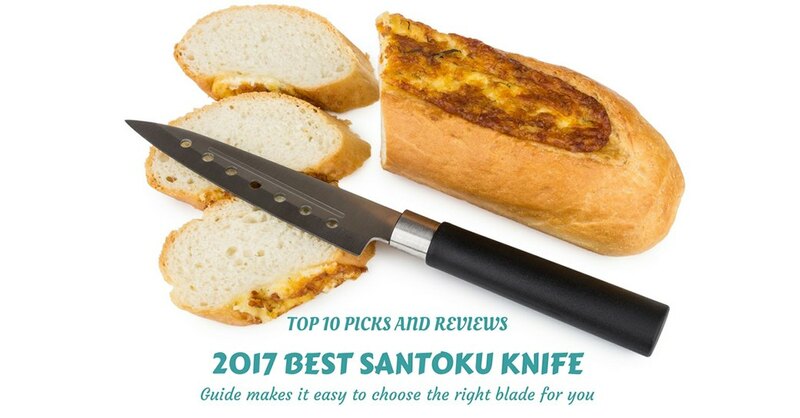 Out of all the santoku knives, we have reviewed, it is very clear that the Shun Premier Santoku made it to the top of the list not just because of it gives the extremely great performance as a santoku knife, but also is very comfortable to use. It may be very expensive but it is definitely worth it since it would last so long that you can pass it to the next generation if you take good care of it. 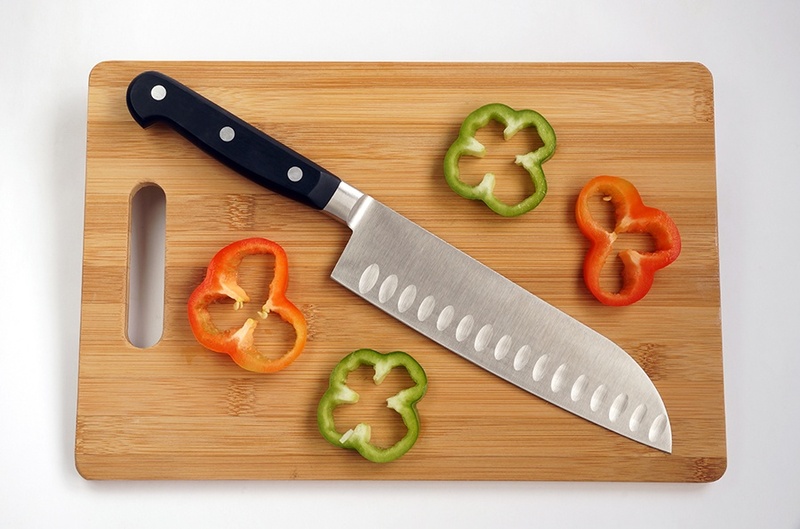 For more kitchen knives like bread knife, butcher knife, electric knife or even pizza cutter, check them here.